I decided to try colouring. The base is not mine, but is used with permission. I did this a while back but I think I forgot to post it. YESSS GARRUS FTW. I need to color more. what did you color it with? i like it but i think it needs a little more shading to make it pop. If you did this in photoshop, try throwing a layer under that base and colour in the layer under the base, if the base is just pure lineart you can freely colour without being scared of colouring over the lines. Why not use Paint Tool Sai instead of mypaint? It'll allow you to set the base layer to multiply and color underneath it on a separate layer, and if you decide to purchase it instead of swipe it off the net, it's like, $50. If you need help finding Sai let me know and I'll find a download and send it to you. It's also a very nice program for making digital art in general, and has an in-program pen stablizer that makes lineart very smooth. ETA you might want to desaturate the purple in the armor, and either make it darker or lighter. 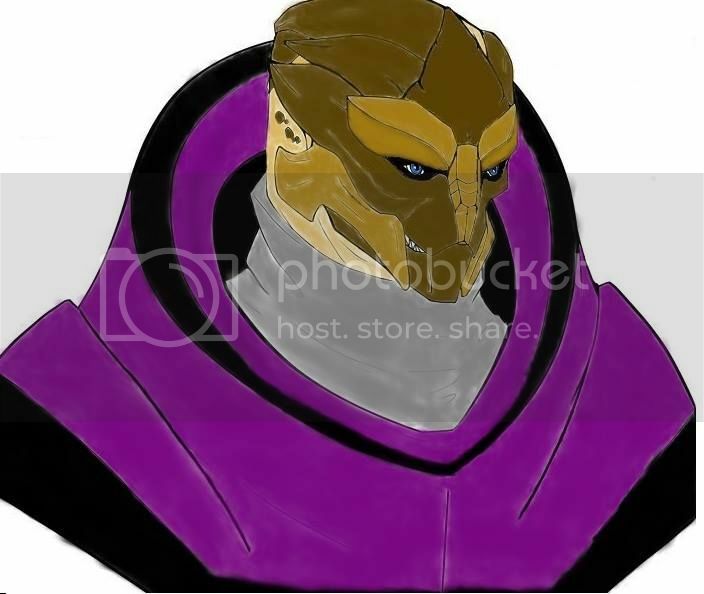 As it is now the value is close to the value of the face, so it doesn't make your turian's face stand out. You don't necessarily HAVE to make this change but imo it might make the color n silhouette stand out more. Edited by fiend, 29 August 2015 - 02:22 PM. I love Garrus! You did an excellent job. I had a laptop bag made with his image, and it turned out so well.